At last, with the fantastic help of Peter Sharkey, I’ve created a page for Air Force One. You may recall that there is already a page for the 3D model of Air Force One, but the new page includes a full history and photos of all the different versions of the airplanes of the chief executive, from Sacred Cow to SAM 29000. Don’t forget that you can keep an eye on Pete’s work on Wingnut’s Workings. EDIT: Weirdly, I happened to be watching Stephen Fry in America episode 7 (because I’m cultured, you know) and he visited, among other places, the Air Force moth ball facility in the desert. I immediately picked out one of the 707-based Air Force One aircraft among the planes, altho the tail number was obscured by sun. 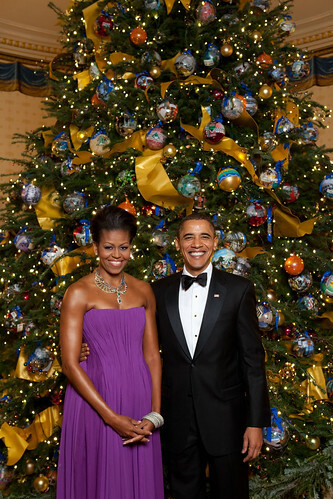 The White House photostream has put up some photos of the Christmas decor and events. There are some wonderful images of performers, guests, and ornaments for the holidays. Also, I just noticed an image of the president getting a vaccination in the White House doctor’s clinic, a space we haven’t seen for quite a long time. The White House has released a great video showing off the Sit Room. Thanks to Colton, and also to Pete, who has already done some captures. I’ve changed the front page to a nice photo of Obama walking thru a corridor in the West Wing with a gift-wrapped present. It’s by Pete Souza, of course, from back in October, but seems appropriately Christmasy.